The third time proved to be a charm for the NASCAR Weekly Racing Series presented by Dodge at the Dubuque Fairgrounds Speedway. Following two consecutive rainouts the much anticipated season opener was finally run on Sunday, May 5th. The Iowa Illinois Taylor Insulation Late Model feature was the headliner of the program, with a stellar field lined up to take the green in the 25 lap main event. The lineup included a front row of Darren Miller and Steve Boley, Gary Webb, and Terry Neal were in the second row, the starting field also included heavy hitters Jeff Aikey, Brian Harris and Denny Eckrich. The �Flyin 50� of Denny Eckrich started in the sixth row but Eckrich was not about to let the heavy hitters up front get away with the top prize on this night. Eckrich quickly moved to the front to set up a great four car race for the lead. The foursome included Miller, Boley, Webb and Eckrich. The fans were treated to an outstanding race amongst four of the very best NASCAR Late Model drivers. Eckrich secured the race lead for good on the 15th lap and went to score the opening night win. Miller took the checkers in second ahead of Webb and Boley. Eastern Iowa�s hottest NASCAR Modified driver is Ron Barker, win number 4 of the early season was notched at the Dubuque Speedway season opener by the Dubuque driver. Barker worked to the front from his third row start and raced with leader Mike Miller under the flag stand on lap ten. Barker led the final ten laps in scoring the impressive win. Miller finished second ahead of Scott Nesteby and Jason Schuller. Dan Shelliam scored his second SPI Pro Stock season opener on Sunday night. 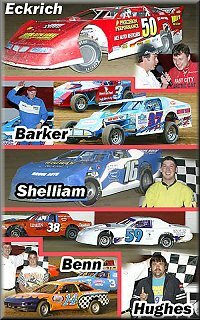 Shelliam won the season opener at the Farley Speedway on April 19th. The Dubuque opener saw Shelliam race the low line to the front from his third row start. Shelliam out raced Jim Brokus to the checkers in the 15 lap feature. Jeff Kennedy crossed the finish line in third. The NASCAR Hobby Stock feature was won by Galena, Illinois� Mike Hughes. The win was the first at the Dubuque Speedway in ten years of competition for Hughes. Jerry Merkes followed Hughes across the line in second ahead of T.J. Leslein. 14 year old Levi Benn scored the feature win in the Farley Flyer division. Benn drove his Ford Probe 4 cylinder to the win over Mark Jaeger and Randy Leehan. The ten lap feature was decided at the checkers with the top three finishers crossing the stripe with less than a car length separating the three cars. Sunday, May 12th the Dubuque County Fairgrounds Speedway will feature twin 25 lap feature events for the Iowa Illinois Taylor Insulation Late Models. In addition a full program of racing will be held in the other four divisions. Racing will get underway at 6:30 p.m.